AIDAN RICKETTS: I end up asking the question, you know, someone, presumably in Sydney, was so desperate to secure a conviction in this case that they pulled out all stops, decided to use a previously unheard of charge and proceed through successive prosecution. I mean, I think the big burning political question is: How high up in the police or the state government was it that that button was being pressed? 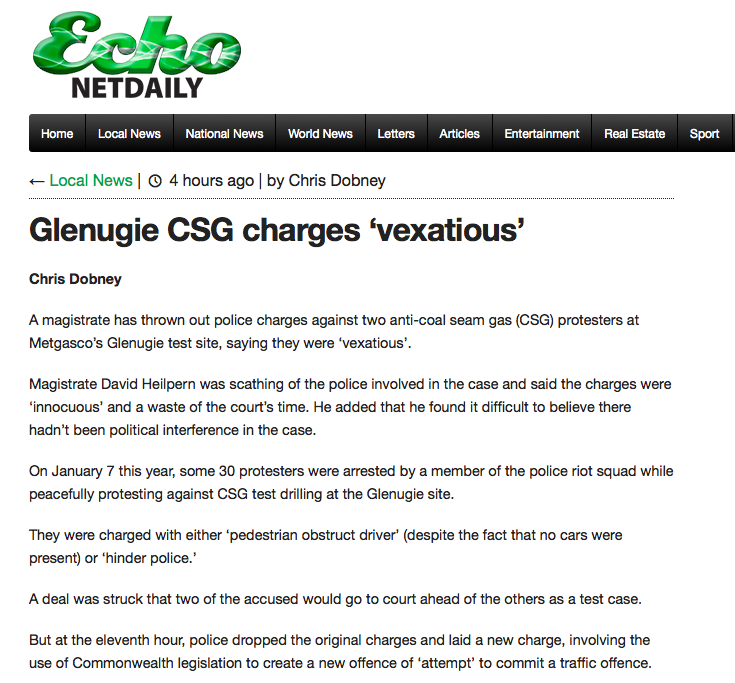 MARK COLVIN: The New South Wales police have been accused of running an absurd, ridiculous and appalling case against a pair of coal seam gas protesters. Last week a New South Wales magistrate threw a police case out of court, accusing the police of running a weak and vexatious case. The magistrate raised questions about political interference, asking why an innocuous minor traffic matter worthy of a $67 fine wasted the court’s time. DAVID MARK: This was a case that started badly and just got worse. STEPHEN BLANKS: The police have brought a vexatious prosecution without any justification whatsoever. DAVID MARK: Stephen Blanks is the president of the New South Wales Council of Civil Liberties. STEPHEN BLANKS: That’s a very unsatisfactory position for the public to be in, and undermines public confidence in the police. DAVID MARK: This story began on a quiet bush track near Glenugie in northern New South Wales on the 7th of January this year. That day, a group of anti-coal seam gas protesters were demonstrating against test drilling by the company, Metgasco. PHILIP WYKEHAM: There were a number of people arrested. DAVID MARK: Philip Wykeham, the solicitor who acted for the protesters, says they were arrested by a member of the police’s Public Order and Riot Squad. PHILIP WYKEHAM: Probably 25 or 30 people. And a lot of them were charged with the same charge, essentially two charges. DAVID MARK: The charges were ‘pedestrian obstruct driver’ and ‘hinder police.’ In order to save the time the prosecution, the defence and the court struck a deal to run a test case against two of the protesters. But then, just days before the case was due to be heard and without informing the court, the prosecutors pulled their charges. Stephen Blanks. STEPHEN BLANKS: The police then after withdrawing the first two charges introduced on the last possible day a new charge of attempting to obstruct traffic. Now this is an offence which the magistrate has – says that he’s not aware of any other prosecution for such an offence, and indeed the offence is almost absurd. PHILIP WYKEHAM: It was a charge that was so insignificant that even if everybody had been found guilty of it, I mean, and even if anybody had been sentenced to something, they would have been sentenced to, you know, it would have been a $20 fine or something like that or a $30 fine it would have been. It was all of such trivial proportions. DAVID MARK: “Innocuous indeed,” as magistrate David Heilpern wrote in his judgement last week. In fact he asks whether there was any political interference in the decision to go ahead with the case. DAVID HEILPERN (voiceover): In this case I find myself asking what could possibly be the reason for continuing on with such an innocuous charge in these circumstances? Why else would police risk cost orders against them, drive a prosecutor up from Sydney to run the matters, arrange police witnesses to travel from Sydney, all for an innocuous minor traffic matter. 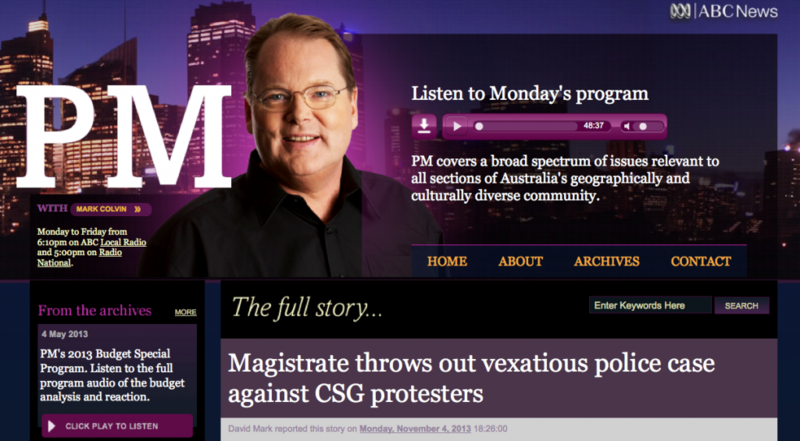 DAVID MARK: The magistrate says the CSG issue is political. He notes the defendants who have come before him are farmers and professionals, many of them in their 50s. 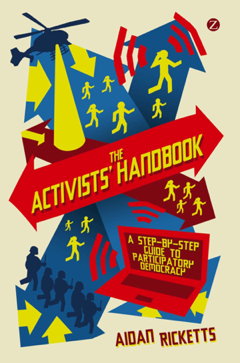 DAVID HEILPERN (voiceover): It is in that context that the realistic suspicion of political interference arises. DAVID MARK: Philip Wykeham, the lawyer for the two defendents. PHILIP WYKEHAM: It was as though somewhere down the line somebody was having some sort of face saving exercise. And whether it was the Public Order and Riot Squad or whether it came from higher up the chain, I guess we’ll never know. DAVID MARK: Aidan Ricketts is a law lecturer from the Southern Cross University and a spokesman for CSG Free Northern Rivers. DAVID MARK: Stephen Blanks from the New South Wales Council of Civil Liberties. STEPHEN BLANKS: It might have been the police acting on their own. There might have been pressure placed on the decision makers in the police to make this ridiculous decision, but we should try and find out. The public’s entitled to know how such an appalling decision was made and why. And the police should be up front in explaining its decision. DAVID MARK: PM did ask New South Wales Police why they went ahead with the prosecution. They said they wouldn’t comment because the case is still within the 21 day appeal period. Magistrate David Heilpern wavered as to whether there was political interference in the case, but eventually he decided he wasn’t satisfied there was. But he did find that the police’s case was vexatious. STEPHEN BLANKS: It’s a rare situation where a police prosecutor will allow a prosecution to get to this point where the magistrate makes a formal decision on it. MARK COLVIN: Stephen Blanks, president of the New South Wales Council of Civil Liberties, ending David Mark’s report. Read more at The Echo website.